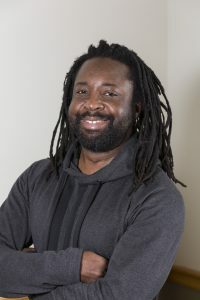 St. Paul, Minn. – Macalester English Prof. Marlon James is scheduled to appear on Late Night with Seth Meyers, Tuesday, March 3. Locally, the program airs on KARE-11 at 11:35 p.m.
James is a finalist for two major awards for his critically acclaimed novel, A Brief History of Seven Killings: in the Fiction category for the National Book Critics Circle Awards which will be announced March 12, and in the Novel & Short Story category for the Minnesota Book Awards which will be announced April 18. He is originally from Jamaica and is also the author of The Book of Night Women and John Crow’s Devil. James received his MA from Wilkes University and his undergraduate degree from the University of the West Indies.